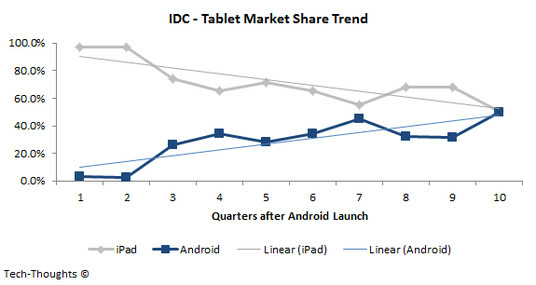 The Apple iPad has been steadily losing market share ever since Android tablets were released into the consumer space, and we've all known that at some point Apple would lose its majority in the market. Well, one brazen analyst has thrown caution to the wind to predict that exact thing will happen by mid-2013. will surge again before falling back. According to Singh, both the drop and the surge are due to the recent iPad announcement. Apple traditionally has a drop in shipments and sales just before a new product is announced, or before a product refresh is announced, and Apple did both recently with the iPad 4 and the iPad mini. So, the new tablets from Apple will surge this quarter and next, but eventually Android will catch up anyway, because Apple's two tablets vs the myriad Android options isn't exactly a fair fight. Ultimately, in either Q2 or Q3 of 2013, Apple will finally, and maybe permanently shift into second place in the tablet market, behind Android. Once anything starts plunging it's tough for it to make a comeback though not impossible. However, no one is taking into account the negative sentiments arising out of patent trolling and that's a significant reason for market share control because every order gained by android world in tab arena is from Apple's share obviously. Didn't SIII sales surge after the award against them? Market sentiments aren't easily guessable by some standard recipe model. What happens if UBUTNU comes on TAB? What happens if M$ Tab really starts picking up market share? Obviosuly it will take away from the then market leader. Apple has to look beyind US market but for that they need to reduce their criminally high profit margins. Unless that happens they can only go southward from where they are even as on date. I want the MS tablet share to grow... Android to produce less but worthy tablets N7 is a good start, and Apple not to sit on their laurels and to gives us more.. we al know you are capable of that... that's what I want for 2013. Apple should not spend time on patent trolling. They may not realise but that's doing them more damage than good as far as market share goes. I personally hate how some company replaces few molecules in sugar with chlorine and then sells it as PATENTED sweetner. Certain things should never be allowed to be patented. Let people copy because those who are well informed maybe williung to pay some premium to original developer but not many would stand behnd a patent troll for sure. Look what happened to "Copyright Troll" called SCO UNIX which went after LINUX and now recently filed for Chapter 7. Wow.....very nice post gallito...I actually completely agree! Unfortunately since android is open source those cheap terrible ones are always going to exist, but the good of open source out-ways that one negative so I'm happy with it. And its also good for those with limited funds, but want some tech. On apple, they either need to innovate (NOT BUY, INNOVATE) something very unique, or, as you said, not sit on their laurels or they'll decline. I dont know how quick, but it'll happen. And for MS, i think they're share will grow just because people are already familiar with windows. Hopefully they won't be to scared away by all the changes in 8, i've used it for a while, hated it at first, but there are some very nice improvements. they need to make their old tablets cheaper! 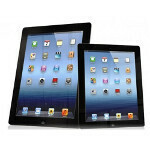 and the iPad mini cheaper too!!! oh well, whatever i say dont make it to apple! they dont listen!